At Shore Ballet School we offer non-competitive dance classes that are fun for students of young ages as well as offering more challenging classes that are suitable for students ages 8 and beyond. Private coaching is also available for serious students. We are a professional school with skilled instructors that are caring and nurturing as well as being trained in leading a classroom. 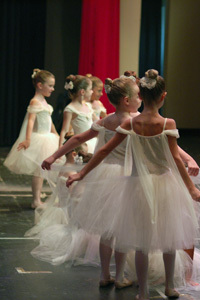 At Shore Ballet School we do not pressure parents into signing up young children for multiple classes or dance teams. However we do encourage children to explore their talents so combination class programs and workshops are available for students interested in trying more than one dance style. As our students journey towards more advanced training we focus on each dancer as an individual. Mature students have the opportunity to study dance multiple times a week to enhance muscle memory and flexibility. We encourage older students to reach their goals by attending class regularly. It has been proven that children benefit most from an activity they honestly enjoy, and good attendance is a key factor in motivating students to perform their best. We believe that students of all ages are impressionable. The teachers at Shore Ballet will always conduct themselves professionally. Our staff will lead by example by being courteous, showing respect and arriving on time with clean and appropriate dancewear. We do not participate in dance competitions. We focus on music appreciation and the love of performing arts. The Shore Ballet School annual student performance is an exciting part of our dance school curriculum, but “the recital” is not the general focus all year. For the first half of the school year all students at Shore Ballet School will be exercising appropriate skills, working with others and learning the required dance steps of their level. They will be instructed how to move their bodies in a safe manner and will be guided carefully in using their muscles properly to avoid injuries. As the students enter the second half of the school year, teachers will start rehearsing the performance pieces, which incorporate the skills they have mastered since the beginning of the year. Costume week is especially fun when students get to see and try on their long awaited performance outfit. Shore Ballet School chooses affordable, age appropriate costumes for our students. Shore Ballet organizes one dress rehearsal in preparation for the annual show.